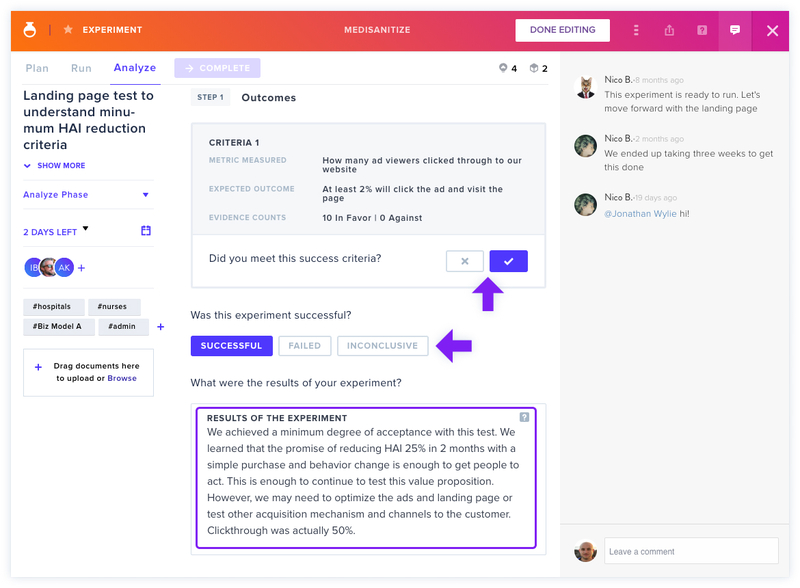 The Analyze phase allows you to assess and draw conclusions from your Experiment. In this step, you'll describe what happened, what you learned from it, and how that impacts your Ideas and Project. In the Outcomes section, select whether or not you met your success criteria. Since this is a clear metric, there cannot be an inconclusive result and it can only meet or fail to meet the success criteria. Mark if your experiment was successful, failed to achieve its goal, or if the results were inconclusive. Next, state your experiment results; what actually happened? In the Insights section, state your main takeaway from this Experiment and your results. What was the essential learning? 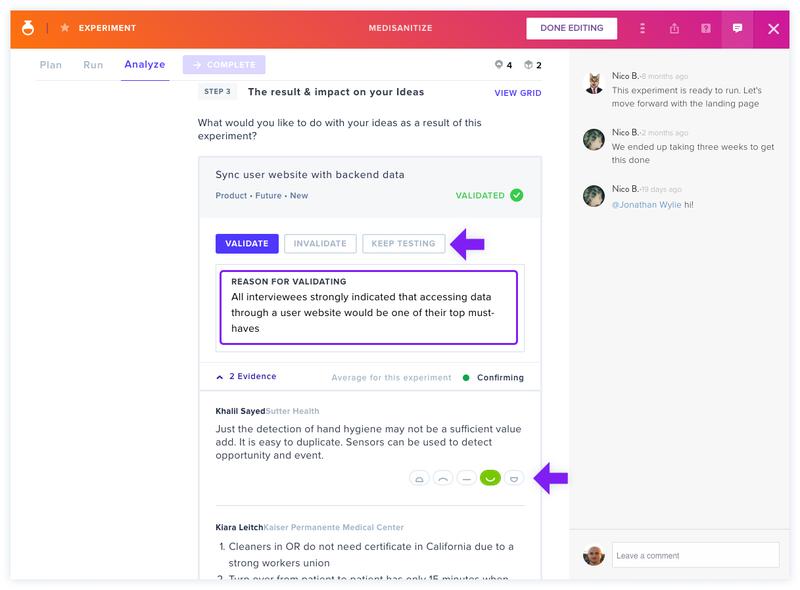 If you elected to connect ideas to this Experiment, then the Impact on Ideas section allows you to update the status of your ideas. Based on the ratings you gave this idea in the context of each piece of evidence, an average score appears below (Leaning Confirming, for example) to help you figure out if you're ready to validate, invalidate, or keep testing this idea. It may be that the results of the Experiment were conclusive enough to influence your Idea. If this is the case, you can validate, invalidate or keep testing. Finally, if you want to move this Experiment from your Active to Completed Workspace, click Complete at the top to indicate that you're done working on it. This will complete your Experiment and you will no longer be able to edit it. 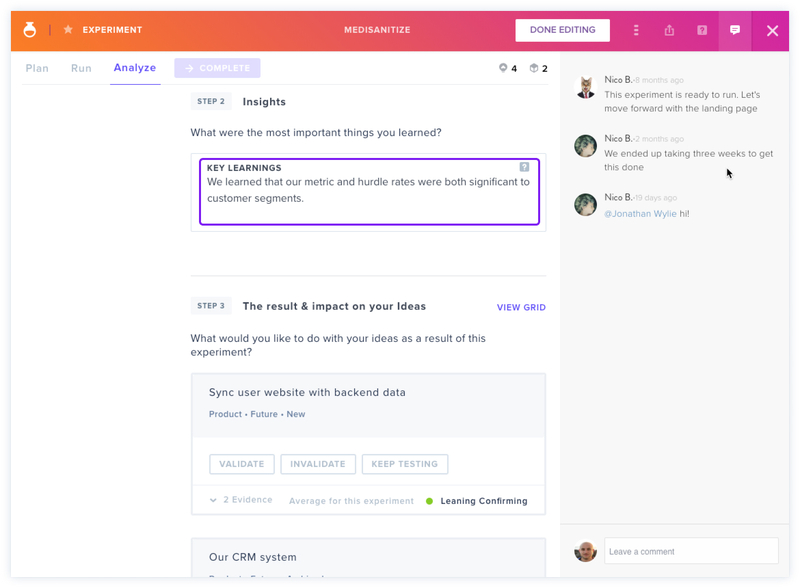 Now that you've completed an Experiment, learn more about adding comments.